Well, clearly I am exceedingly late in writing this post. I made my ride with the Hunt (as proposed in “Joining the Wild Hunt“) over four months ago. What took me so long? In short, it was a profound experience and I wanted to make sure that I could convey as clearly and accurately as possible. So, here we go. A friend and I decided to join the Hunt. I invited her to my apartment late at night on December 21st, the first day of the Hunt according to lore. We prepared an altar, briefed our spotters (two mutual friends of ours) on what to do if it should all go wrong, and then we set out on our journey, veiled and enthusiastic. Once I placed the veil over my head and face, I grounded, centered, and lulled myself into trance. As my trance deepened, I could feel myself begin to sway. I entered the void between my own consciousness and What Lies Beyond, between the Inner World and the Other Worlds. From the void sprang a door, my access point to the Otherworlds. I always see a door when I journey. Many times it will have different runes etched onto it, depending on what my intentions are and where my destination is. This door, the door that would lead to the Hunt, held the rune Eihwaz. I associate Eihwaz with the World Tree and journeying. Given the gravity of the task before me, Eihwaz seemed appropriately suited to facilitating a long and difficult journey into one of the great events of the Otherworlds’ seasonal calendar! Once the anticipation of the impeding experience subsided a little, I reached out to open the door. Just as I grabbed the brass knob and began to turn, I cut myself on a splinter. Blood ran down my fingers and hand. This had never happened before; however, I instinctively knew that a blood/energy offering was needed for my journey (in addition to the offerings that my friend and I had already made), so I did not let the unexpected bloodletting detour me. I stepped through the door and greeted Barn Owl, my fylgja, who was perched on the mantle. I approached him and offered fat white mice from my own energy field to boost his energy for the journey. He sucked two down before raising his head to inform me that we needed to hurry lest the Hunt embark without us. I nodded and he flew from the perch to the door, where he grew in size so that I could ride on his back. We ascended the World Tree, Yggdrasil, headed toward Asgard. Barn Owl knew the way; his knowledge of the Otherworlds is always astounding because he never lets on. He just gets us where we need to go and does what I need him to do. In the borderlands of Asgard, in the grey Mani lit skies above a forest there, I saw the lead Hunter of the Furious Host. He was robed but his eyes and some of his face shinned through. He was not Odin (I knew for sure because he had both his eyes) but he was imbued with some portion of the Great God’s power. He accepted by offerings on behalf of Odin. What was remarkable about the Hunt’s Leader is that he had little affect. His purpose was clear to him and by this point, so close to departure, my presence was simply one more item on the check list. So, in the midst of his matter of fact demeanor, you can imagine my surprise when he grabbed my left wrist and pulled me into the Host. My physical senses once I entered the Host seemed to spread out and encompass more. Touch especially was affected. I could feel the presence of the Others in the Host. Also, it was extremely fast. I could feel the momentum, the pace, the enthusiasm of the experience. My emotional state shifted between giddy exhilaration and plain old fear as I felt the epic and ecstatic pull of the experience threatening to never release me; not because I would be forbidden to leave but because the uniqueness of the experience would compel me to chase it indefinitely. Because of the powerful sensory shift that occurred and the very quick pace of the Hunt, it took me a few minutes to adjust. I ran with the Hunt at various levels/with various groups of beings. The Host included disir, vitkis, and volvas in the middle or central layer; ghosts and wights at the bottom layer traveling closest to Midgard; and warriors, nobles, and other honored dead at the highest layer farthest removed from this mortal plane of existence. Other beings moved throughout the Host circulating through all the groups, these were primarily shapeshifters (though the Berserkers stayed closer to the warrior layer but did mingle with the vitkis, disir, and volvas) as well as hunt animals. The main animal attendants to the Hunt were ferocious dogs and (very) large (very) wild horses. Amazingly, I was able to move across the various Hunt “layers”. I assume I had this permission from Odin/the Hunter himself. I began my ride with the Furious Host in the “middle” layer. That layer contained the beings most like myself, primarily female ancestral spirits (disir), vitkis, volvas, and the occasional shapeshifter. That layer was particularly interesting because that was the layer that seemed most concerned with the happenings of human life. The mothers and grandmothers – the disir – whispered blessings in addition to laying some foul curses. Blessings were for all the things you might expect, but mostly for health and fertility. The curses that I heard spoken were to undermine the same. Some of the vitkis and volvas wove spells, others remained silent. Others, like myself, may have been there to gain spiritual insight or wisdom. The goals and intent of these magickal individuals was – not surprisingly – hidden from me. Their spiritual journeys are their own. Within this layer, I also met a female Lead Hunter. She may have been Frau Holda’s representative, or the Frau herself. Recognizing her as equal co-Leader, I gave offerings to her as well, which she accepted and then made her way back to the head of the Train. It was in this middle layer that I came to truly understand myself as a part of the Host. When that revelation settled in, I let out a screech and descended into the foggy lower layer of ghosts and wights. I made three separate human contacts while in this layer. In my first descent from middle into lower, I came upon a man in a parking lot. He was alone. As he approached his dimly lit vehicle and removed his keys from his pocket, I manifested – to my perception – as a mist, made of the same cloudy matter that constituted the ghosts and wights. The man dropped his keys out of fear. He did not seem to see me but he could sense an ominous presence, I suppose. After startling him, I rapidly ascended back into the second layer and then whisked down again through the lower layer where I encountered a woman walking home in what looked to be a suburban neighborhood. I manifested in a similar way and she quickened her pace. The last human encounter was with a young boy of perhaps 12 years who was particularly slow in getting into his home after returning from an event with his family. That encounter was particular interesting because he could see me. For him, I was not simply a creepy sensation over the shoulder provoking fear or dread. He saw me but what exactly he saw I cannot be sure. Based on his facial expression, he seemed more awe-stricken or even surprised than afraid. My experiences in the lower layer were powerful because that layer seemed to house the beings that have the most direct, daily influence over/contact with people, whether people notice them or not. I am still uncertain what my contact with those three people signified. Maybe it was an omen that they were fated to die this year. Maybe it was simply an indication that they needed to heed the lore that says you should not be out and about on the night of The Wild Hunt. Maybe it’s not for me to know what purpose my actions that night served. Upon ripping back into the middle layer after a romp with the mortals, I was greeted by the largest, fiercest beast I have ever seen. The pitch black, wild-maned horse had to be a foot taller than me with eyes ablaze. He stood and looked at me and I at him for what felt like forever. Then, I got the distinct impression that I was supposed to climb onto him. I did and then he sped through the already speedy Hunt. With lightening quickness, we moved further up in the train, closer to “the front” I suppose as much as an ethereal and epic phenomenon can have a “front”. Then we bolted up to the highest layer, where the warriors and kings thundered and shouted and reveled. There were many warriors of various types. I remember this being the most frightful segment of the Host. Many of the warriors were maimed and broken in sundry ways. Others were simply bloody. Still others had a might and ferocity in their eyes that gave me chills. There were also berserkers and other shapeshifting shaman-warriors. I was shocked by some because I could very clearly see their animal characteristics manifest over and above their human qualities. There were also more horses in this portion of the Train, but none so mighty as the horse I rode upon. The warrior level became very uncomfortable for me very fast. Between the bloody injuries and the general sense that my welcome was running out, I returned to the middle layer to be with “my kind” – vitkis, volvas, and the ancestral dead. When the journey was complete, my fylgja returned me to my home base in the Otherworlds. I gave him more mice and then I stepped through the door that led to waking consciousness. What I expected least from my journey was the breadth and depth of experiences. I had not considered that The Wild Hunt would have such a diversity of participants. I knew that the disir and warriors as well as ghosts were often a part of it, but I had not given too much serious and structured thought to other beings. Also, I realized that each “layer” had a function. The upper layer – the warrior layer – seemed to be the fuel for the whole thing. Their war cries and tumultuous storm-like energies may have provided the energy that it need to get up and go. The middle layer of magickal folk and ancestors was critical to ensuring the continuation and temporal integrity of families and generations. They seem to be the driving force behind the fertility lore sometimes associated with the Wild Hunt. The lower level of freshly disembodied spirits and various wights seems to be those caught up by the Hunt. Some beings are too weak or confused to resist the pull of the Hunt as it tears through the Worlds and other choose willingly to follow the Hunters and the Host where they may go. 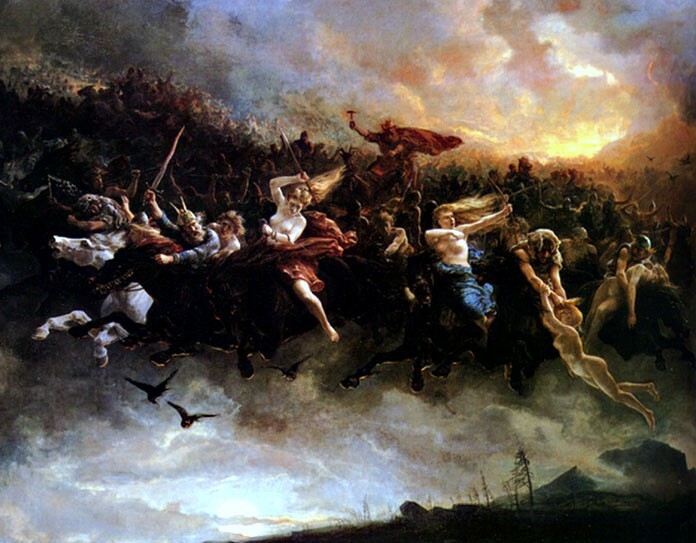 The Wild Hunt as it manifests in the intercalary period between the Winter Solstice and Twelfth Night seems critical to clearing the old year and laying the solid foundations needed for the new year. What has expired is removed, and health and fertility are returned to the people. In this way, the Wild Hunt acts as one of many shuttles weaving Wyrd. This entry is my attempt to put a profound spiritual experience into words. The feelings, the senses, the energies afoot that night were powerful. I give thanks to the Hunters and to Odin and Frau Holda for granting me the privilege of joining the Furious Host of the Wild Hunt and for blessing my journey so richly. Hail! This entry was posted in Runes, Spirit Work and tagged Ancestors, Berserker, Eihwaz, Fylgja, Ghosts, God Odin, Goddess Holda, Journeying, Shaman, The Furious Host, Trance, Vitki, Volva, Warrior, Wights by Wandering Woman. Bookmark the permalink. This truly was a profound experience. You do very well with your descriptions, but I’m sure the words fail the truth of the experience! Very interesting perspective on The Hunt, one that you’d only be able to attain through first-hand experience. Thank you for sharing it with us!